Published in 2006, this booklet is still valuable as it shed's light on how the Right advanced its agenda in higher education beginning with a strategy that was mapped out five decades ago and that is bearing fruit today. The report from Speak Out and the Oakland Institute, Turning the Tide: Challenging the Right on Campus, calls for building a broad-based and sustainable movement for progressive values on college campuses. Turning the Tide, with an introduction by the late-historian Howard Zinn, presents a historical analysis of how the Right has advanced its agenda and strategies used to gain political influence on campus. It asserts that through strategic planning and massive funding, the Right has been able to reach and influence students and dominate the campus arena, and ultimately reshape politics and public policies at the national, state and local levels. 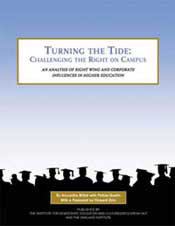 On the basis of this analysis, the report draws upon Speak Out’s network of scholars, artists, and activists to propose a range of recommendations that progressives might consider to lay the groundwork for a campus initiative that includes strategic alliance-building, ways to reshape the public debate, and how we might build a powerful presence on campuses. You can purchase a copy from the SpeakOut store or download a FREE PDF copy of the report here.